Decoded Science asked me to write an article on a new modeling breakthrough in quantum mechanics. It involves sampling and feedback of Feynman diagrams. I read the press release out of UMass Amherst. Oh boy, this is a tough one. Lots of obscure terms like Green’s function, strongly-correlated fermions, and mapping bosonic systems into polymers in four dimensions. Oy! How do I “decode” this stuff so a non-expert can understand it when I have difficulty understanding it myself. So I ask Decoded Science to set up an interview with one of the principle researchers, Dr. Boris Svistunov. I call him. He’s really smart, patient with my many questions, and obviously excited about his work. I take notes and struggle to comprehend what he is telling me. After several conversations, I find I have a much better understanding of the physics. I think. I know from Feynman’s wonderful book, QED, the Strange Theory of Light and Matter, it is impossible to tell what a single particle will do. All physicists can do is tell the probability of a certain outcome. And now I understand there are two ways to determine this probability. Say a photon is emitted at point A. What is the probability it is detected some time later at point B? The photon can simply go directly from A to B. Or it can take one of any number of less direct paths. 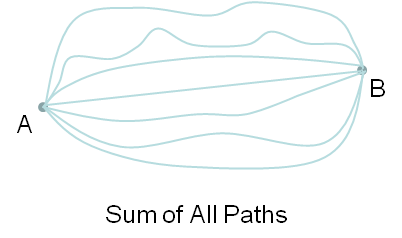 Per the sum-of-all-paths method, all possible paths the photon could take contribute to the probability of detecting it at B. Which path did the photon actually take? It seems it took them all. Why? Because when we sum all possible paths (more precisely we sum amplitudes for each path, then square), we get the probability of finding the photon at B. Imagine an electron going from A to B. It could go from A to B with no interactions. (diagram 1). Here the straight line represents the sum of all the paths it could take. Or the electron could emit and absorb a photon along the way (diagram 2). Or the electron could emit and absorb two photons along the way (diagram 3). Or one of the photons could transform into an electron and anti-electron (positron), annihilate, and produce a new photon along the way (diagram 4). Etc. Each Feynman diagram depicts possible events which could happen as the electron goes from A to B. But what versions of interactions actually occur? Again, it is though all versions occur. Why? Because when we add all possible diagrams (all the amplitudes and square), we get the probability of detecting the electron at B. This is so strange. But it works. It makes super-accurate predictions. So it must be telling us something about reality. I learn something every day. Which is no doubt a measure of how little I know. Link to article is here. Hola! I’ve been following your website for a while now and finally got the courage to go ahead and give you a shout out from Dallas Texas! Just wanted to say keep up the good job!